Disney and Imangi Studios are teaming up to release a movie tie-in for the upcoming animated film Brave. 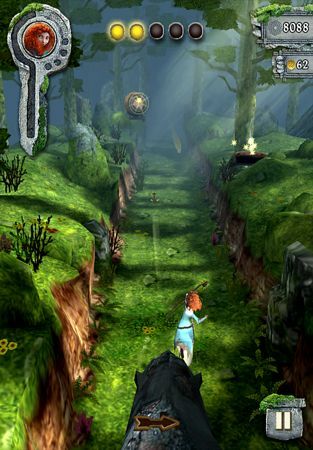 Appropriately named Temple Run Brave, this game will feature Merida, the red-headed main character from the Brave movie. Unfortunately for Merida, she has been placed into a Temple Run game which means the poor girl is going to be chased relentlessly by the evil demon bear from the movie called Mordu. However, aside from the change to characters in Temple Run, this new movie tie-in will pretty much feature identical gameplay from the original Temple Run game. There is a new section within Temple Run Brave though to at least make it a bit more of a movie tie-in. This new section is an Archery section which is sort of a homage to Merida's skill with a bow and arrow. During these sections, targets will appears on the left or right which you can tap on quickly which makes Merida shoot them with her bow and arrows. If you hit all the targets in a section you will earn a bonus. Imangi Studios and Disney's Temple Run Brave will land on the Google Play store on June 14th and, of course, it will most likely be free.